Worldwide, integral type bridges are being used in greater numbers in lieu of jointed bridges because of their structural simplicity, first-cost economy, and outstanding durability. In the UK and the US states of Tennessee and Missouri, for example, the construction of most moderate length bridges is based on the integral bridge concept. The state of Washington uses semi-integral bridges almost exclusively, while, depending on subfoundation characteristics, the state of Ohio and others use a mix of these two bridge types. 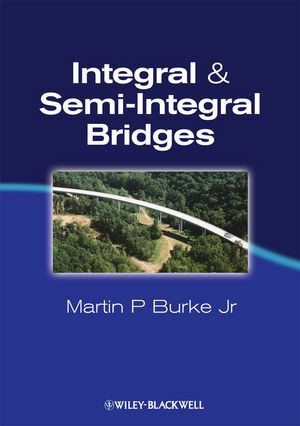 Integral and Semi-Integral Bridges has been written by a practicing bridge design engineer who has spent his entire career involved in the origination, evaluation and design of such bridges in the USA, where they have been in use since the late 1930’s. This work shows how the analytical complexity due to the elimination of movable joints can be minimized to negligible levels so that most moderate length bridges can be easily and quickly modified or replaced with either integral or semi-integral bridges. Bridge design, construction, and maintenance engineers; bridge design administrators; graduate level engineering students and structural research professionals will all find this book exceptionally informative for a wide range of highway bridge applications. Martin P Burke Jr PE. Bgean his career at the Bureau of Bridges of the Ohio Department of Transportation where he remained as a career employee and served in all aspects of bridge engineering (design, construction, research, and inspection). After retiring from the Bureau as the Assistant Engineer of Bridges, he joined Burgess and Niple, Consulting Engineers and Architects, at its main office located in Columbus, Ohio. At Burgess and Niple, he served as a Staff Assistant and Technical Advisor for the Bridge Design Group. In that capacity, he was responsible for the conceptual design of major bridge projects, guiding the review of major bridge design, rehabilitation and construction projects, and guiding the inspection of major bridges. Subsequent to his retirement from Burgess and Niple, he established the firm of M. P. Burke Bridges, Inc.
2 Bridge Damage and the Pavement G/P Phenomenon. 3 Integral Bridges: Attributes and Limitations. 4 Design of Integral Bridges: A Practitioner’s Approach. 5 Genesis of Integral Bridges. 6 Cracking of Concrete Decks and other Problems with Integral-Type Bridges. 7 Land of no Special Computations. 8 Semi-Integral Bridges: Movements and Forces. 9 Emergence of Semi-Integral Bridges. 10 Elementalistic and Holistic Views for the Evaluation and Design of Structure Movement Systems. 11 Awareness of Reality in Bridge Design. Appendix 1 The Pavement G/P Phenomenon: The Neglected Aspect of Jointed Pavement Behavior.